We have yet another installment of our customer pictures and testimonials for our ever-popular BendPak HD9 Car Lifts. We have sold a whole bunch of these popular lifts over the course of the past several years, and customers are always calling and emailing us to share their stories and pictures of their favorite cards on their lifts and in their decked-out garages. As you take a look at the image below, you will see that he purchased two lifts to store his vehicles on and under. This is probably the most common purpose for people purchasing these lifts. They help the home / hobbyists out there who have run out of garage floor space and don’t want to expand their garage. When you look at it as compared to expanding a garage, the purchase of the HD9 BendPak Lift is actually a money saver. But don’t forget, this is not just a storage lift. It is also a great service lift. 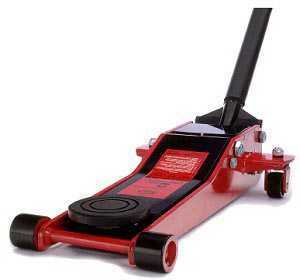 It can be used for anything from oil changes, to transmission changes. And with an optional air bridge jack, or jack plate, you can even access the wheels for brake work. Many customers new to offering alignment service have many questions about it. What are the features of various Alignment Lifts? What type of lift should I get? Should I get an open front alignment Rack? Should I get a four post, or scissor lift? Many manufacturers will include turnplates in the purchase of an alignment lift. Some do not. Some will include rolling jacks as part of a package. Most will not. BendPak offers several types of alignment hoists. They offer the traditional four post rack in several lengths and capacities. All the way from 14,000 lb to 35,000 lb lifts. They offer standard length and extra long models. They also offer an open front model in a 14,000 lb. capacity. An open front alignment lift is desired by many shop owners who want to be able to walk easily between the runways without having to duck down under the front cross member to get in between the runways. It’s a convenient feature to have, but it will cost significantly more than a standard four post rack, because there is significant engineering involved to accomplish the task of removing that cross member. They also offer a scissor alignment lift. These are very special lifts that are desired by shop owners that want the open front feature, but don’t want to take up too much of their shop floor space. The scissor lift takes up significantly less floor space along with the open front feature. Again, because of the added features, a scissor lift will cost significantly more than a four post lift. BendPak alignment lifts include the turnplates in front and the slip plates in the rear. What they do not include are the air bridge jacks. Those are sold separately. To perform alignments you need to raise the wheels off the runways, so two jacks would be desired. The other thing required to perform alignments would be an alignment machine. We’ll get into more detail about them in future posts. Shop owners looking to get into the alignment business find that is an expensive initial investment, but that it pays for itself rather quickly. What Type Of Air Compressor Should I Get? This is one of the most common questions we get. Customers opening an auto shop, or facility of any kind that requires an air compressor often don’t have any idea on what type or size of air compressor to get. First, you need to determine if your application requires a gas powered or electric powered compressor. If you are mounting a compressor to a service vehicle or using it in a remote location, where power isn’t available, then a gas powered model is in order. Most auto shops will use an electric Air Compressor. When determining what size to get, the most important factor to consider is what size shop do you have? How many bays are you operating? Will thay all be operating at the same time? The rule of thumb is to add up the CFM (cubic feet per minute) requirements of all of the tools that you will be powering at any given time and then get a compressor that will supply more air than that. The owner’s manual of the tools should indicate the CFM requiement for the tools and at what PSI they need to operate at. 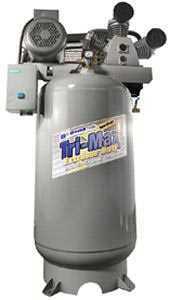 Most commercial shops will require a two stage compressor of at least 7.5 HP with an 80 gallon tank. Some will require a larger compressor, some smaller shops can get by with a five HP two stage model. In a typical three bay shop, the air requirement will typically require about 20 to 28 cfm at 100 to 175 psi. We will continue with more posts about the differences between the different types of air compressors, (ie: reciprocating and rotary screw) so keep an eye out. We always like to keep you updated on the latest pictures that customers provide us of their products that they purchased. The latest entry is the BendPak MD6XP Mid Rise portable Car Lift from Raymond Haney out of Roseville, CA. Ray said, “Hey Guys. Here’s a couple of pictures of my new MD6XP scissor lift. It works great. Thanks for everything”. As you can see, he laid down a couple of 2 x 12’s on either side of the lift. This is a common practice when you have an extremely low profile vehicle and you don’t want the car to bottom out on the lift. The lowered height of this BendPak lift is 5″, so as long as your vehicles are higher than that, you don’t need to worry about it. For those vehicles that are low profile, simply place a couple of 2 x 12’s on either side of the lift as wide as the track of the wheels on the car, and then drive up onto the boards. This should give you the clearance you need on most low profile cars. Features on this lift that make it so popular are that it is portable, it allows access to most of the vehicle, and it can accommodate a wide variety of vehicles. And of course it’s made by one of the best names in the business – BendPak. ASEdeals.com is pleased to announce the introduction of yet another new BendPak Lift. The model HD9-SWX double wide car parking lift. This is the latest in the line of Bend Pak four post lifts. This lift was made specifically for customers who want a four post lift for parking two vehicles side by side, and then you can park two more vehicles underneath. It’s a really cool idea. We’re surprised they didn’t come out with it sooner. The benefits of this lift over their traditional four post lift is that you can store two vehicles on and under it, not just one. It ends up being narrower than placing two four post lifts side by side, so it saves on garage floor space, plus, you only have four posts as opposed to eight posts if you were to get two single car four post lifts. Not everybody needs a car parking lift like this one, but for those folks that do, it can really come in handy. It’s a special order item, so the lead time will be significantly longer than the standard four post models. Check it out on our web site and give us a call with any questions. If you’ve followed us over the years, you know we’ve been carrying the Jump N Carry Jump Starters for many years. They are made by Clore Automotive and they have always been the best in the industry. Well now Clore has come out with some new models that are an improvement over an already incredible line. It’s their new X-Force Jump Starters. They took some of the great features of their original line of Jump N Carry Jump Starters, and added some key improvements to make a truly top-of-the-line product. The durable one piece case is still there. It will hold up to the abuse that a typical shop will dish out day-to-day. The handy gauge that not only tells you the state of charge of the unit, but can also tell you if the vehicle’s alternator is working properly. Let’s face it – The most important feature of a battery jump starter is it’s battery. It can have all the bells and whistles, but if it can’t jump the vehicle, what good is it? That’s why the X-Force Jump Starters excel so well. The batteries in these units are superior to anything on the market. 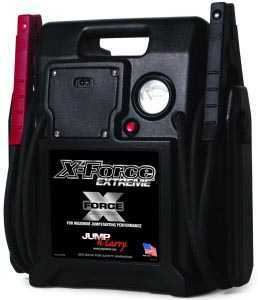 They provide more power, (30% more) than any other jumpstarter of comparable size, and are sure to last longer as well. Plus they hold a charge longer and reduce sulfation. stroke diesel-powered vehicles fold beneath the massive power of this crusher. Plus it removes 95% of the waste oil. An integrated collection chamber and collector downspout makes oil recovery a cinch. At the dramatically reduced size, cans and oil filters are much cheaper to dispose of, so the Ranger RP-20FC is good for the environment AND your wallet. There is also a handy stand available as an optional accessory. You can view this model on our web site along with a video shown below that will better show you all the working details. You are currently browsing the Car Lift Blog blog archives for April, 2010.